Can I use a 12 V power supply as the source of electricity for this circuit? And where do I connect the positive/negative of my power supply? I'm a bit new to this so please understand, thank you. Be careful not to touch the 230V part of the circuit! You can use a standard 12V DC supply for the left part of the circuit. The positive terminal (+) is marked on the schematic. I've added R7, to prevent too much current through the LDR when the light is on and R1 is is the lowest (0R) position. Please also note that R4, R5, R6 and C1 must be able to withstand the mains voltage. Normal 0.25W resistors usually have a max. working voltage of only 250V which is not enough ((230V + 10%) * sqrt(2) = 358V). That means you'll need 1W resistors, or at least resistors with a max. 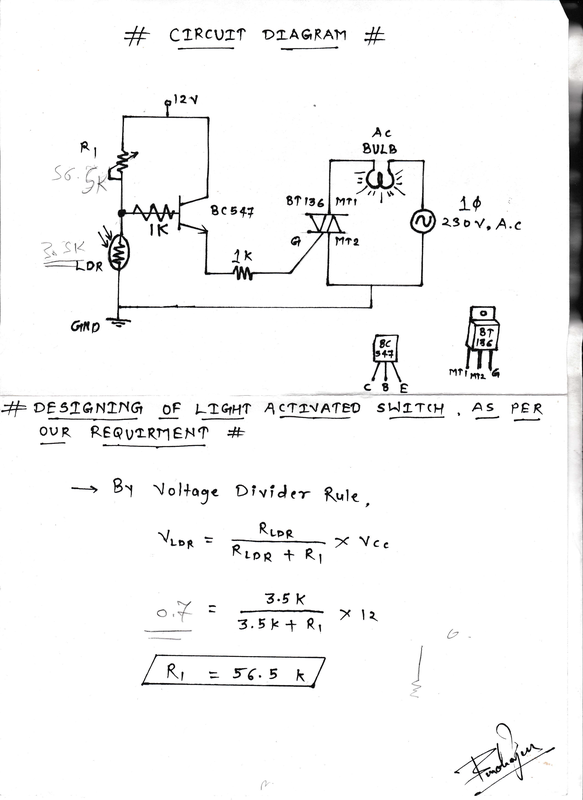 working voltage of 450V or higher. Also you'll need an X rated capacitor for C1. If that's a problem, you could try omitting R6 and C1, as your load is a simple light bulb and a snubber might not be necessary. How to deal with grounding and the capacitors in this opamp schematic? Where to include Stomp Switch on this Boost Pedal Schematic?